Jennifer & Jim got married at one of my favorite Outer Banks wedding venues, First Colony Inn in Nags Head! This spot is classic Outer Banks with it’s cedar shake, wrap around porches, rocking chairs & even a wine hour for guests! It’s the epitome of Southern Hospitality 🙂 It’s also got a great location in Nags Head, just across the street from the beach! It’s no wonder why Jennifer & Jim chose First Colony Inn for their June wedding last year as they celebrated the joining of their families! People joke about the pop up storms we get here in the summer – the forecast can say 0% chance, the sun will be shining and then next thing you know, a thunderstorm is overhead! That’s exactly what happened on Jennifer & Jim’s day, but thankfully not until after their ceremony and mostly all the way through cocktail hour & photos. If rain on your wedding day is good luck, this downpour brought the newlyweds a bucket-full! The best part? The smile never left Jennifer’s face and they just took it in stride, donning rain boots & an umbrella for their introductions! She brought her hair stylist from home, Kaci Trout to pamper her on the big day! The ceremony took place on the back porch of the inn under bright blue skies! A local, Beth Dodson, did the draping for their ceremony on the stairs and Tony Joseph of I Do OBX Weddings officiated. The chairs were placed on both the deck & the lawn and setup by I Do OBX Chairs. Club Violin played as guests arrived and then as the ceremony got started. After the ceremony, Freddie of the Freddie Long Band played guitar for the cocktail hour, then the full band was ready for the party! The tent & all of the rentals were via Ocean Atlantic Event Rentals. 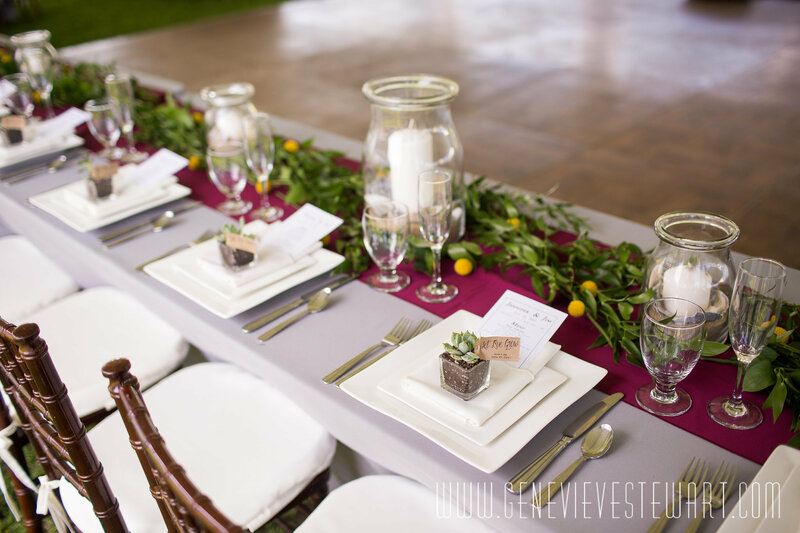 I loved the choice to use darker linens – the charcoal grey for the tables & then a burgundy for the runners- along with the dark mahogany Chiavari chairs. It made the affair a bit more formal! The colors also created the perfect palette for the bright pops of yellow via billy balls & then vibrant greenery throughout. All of the flowers were purchased in bulk through Harris Teeter in Kill Devil Hills & then I arranged the tablescapes using the greenery & billy balls around the client-provided centerpieces! The wedding party flowers themselves, including Jennifer’s great bouquet, were created by the Flower Gallery at Harris Teeter. Heart of Harlow did all of the great hand-lettered signs for the ceremony, bar & more! Basnight’s Lone Cedar Cafe catered the wedding and offered delicious passed appetizers and an incredible buffet dinner! Just Desserts provided the classic, crisp wedding cake and added a few of the flowers & succulents for fun! There to capture it all was Genevieve Stewart Photography & Swell Video – both incredible as always! See some of my favorite photos below & the video by Swell as well!